Lawn Fawn Critters Ever After Unicorn Puffy Clouds Notecard | Stamp Right Up! As soon as I saw Lawn Fawn’s puffy cloud die, I knew it would be perfect to pair with the Critters Ever After set. The stand alone clouds from Spring Showers die set filled out the card perfectly too. I cut a piece of 100lb white card stock to 4bar notecard (3.5 x5), then a piece of tide pool from the Pint-sized Patterns: Beachside paper petite (6×6) collection. The unicorn, from the Critters Ever After set was colored with Spectrum Noir markers: LY1 – CT1, CR2 – PP2, IB1 – OB2. 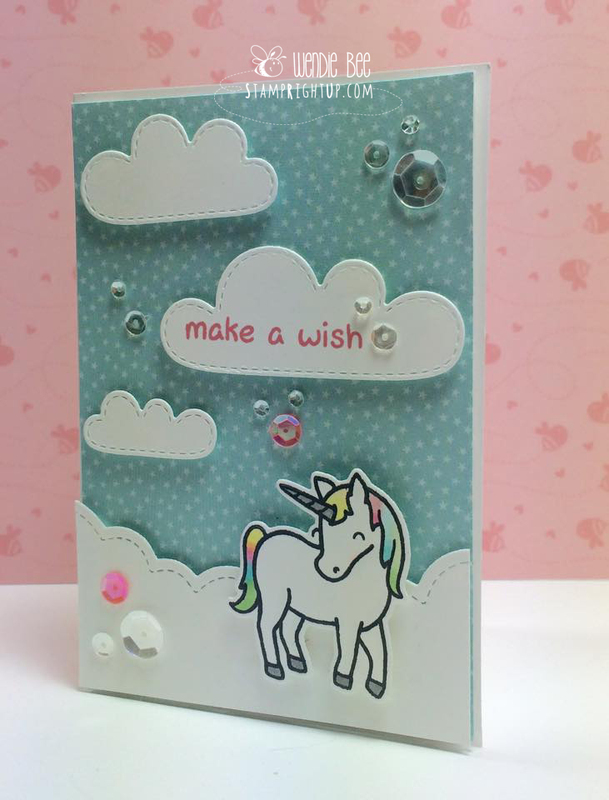 To add a little bit of sparkle, I used the silve wink of stella glitter pen – after all, it isn’t a unicorn without a little bit of sparkle right? !